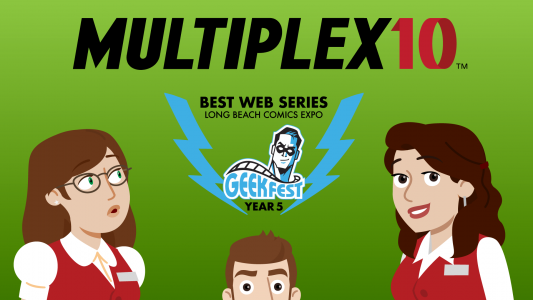 Over the weekend, Multiplex 10 made its debut on the film festival circuit at TWO festivals: the Door County Short Film Festival and GeekFest Film Fest’s first convention of the year, at Long Beach Comics Expo. But not only did it screen at those festivals — it won some honors at each of them, as well, being named a finalist at the Door County Short Film festival and voted Best Web Series by LBCE’s attendees! Thank you, Sister Bay and Long Beach!